Creator Square is Johnstown, PA's Central Park reinvented. 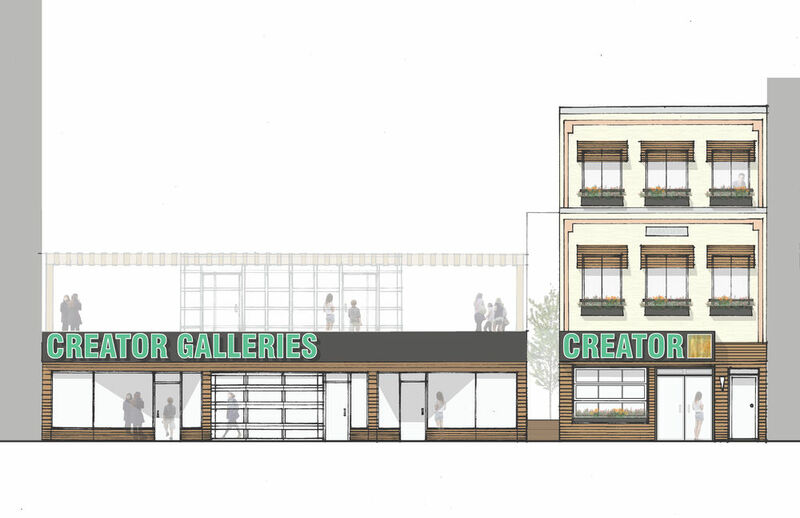 Creator Square Johnstown is a living studio artisan residency and museum development based in Johnstown, PA. It is a key component of the city’s growing artisan population stimulating urban revitalization, economic development, and job-skills training by engaging community members with new economy makers and creating fresh audiences for innovative and traditional crafts. Creator Square Johnstown is composed ofthe Creator Center, a community maker space and museum, and the Creative Masters Program, an artisan residency program for entrepreneurial artisans. These emerging leaders in the local and national maker community are chosen via a highly selective process for residencies lasting from two months to two years in duration. The Creator Center is an adaptive reuse of the historic Parkview Building, located on Johnstown's Central Park. The Creator Center serves as both a community makerspace for workshops and exhibits and as a working space for makers. The facility includesshared workshop and exhibit spaces, live/work studios for the makers-in-residence, a community space for events and education, and a gallery. Helping them grow and develop their own retail, gallery, show, and internet businesses. Developing their skills by actively transferring them to the local population for better jobs and careers in custom classes, as well at local universities and community colleges. A focus on Maker craftsmanship in metals, wood, glass, plastics, furniture, textiles, and more. Building on Johnstown’s historic making and manufacturing tradition. Forming a tight link to the region’s broader educational, arts, and entrepreneurial communities, particularly the University of Pittsburgh-Johnstown Business Program and Idea Lab, as well as the the 3rd Avenue Bottleworks. Complementing social and public works projects such as Johnstown’s Urban Brownfield Revitalization Program, which re-purposes urban sites for modern manufacturing like the Lower Cambria Works along the Conemaugh River. Working in sync with education. Currently, Johnstown High School is working on their own metal Maker Project deploying custom cityscape urban planters for the downtown area. Creator Square is in the developmental stage of its growth. We have the strong support of local industry sector partners, financial institutions, non-profits, and foundations like the Community Foundation for the Alleghenies. This project is a collaboration between Springboard Design and students from Carnegie Mellon University’s Architecture, Public Policy, Entrepreneurship, Engineering, and Arts Management programs. Please read our brief to learn about the project. We welcome new partners, sponsors, and sources of funding. We encourage those interested in supporting or collaborating with Creator Square to connect with us. To find out the most recent updates on our project, please view our most recent updates. To learn about what we are working on and how to help, please view our project report.